Read more about Meet your 2019 Austin Conference Headliners! Like all great events, big and small, there are aspects that we look forward to most and some that are neither here nor there, but we all love perks! Here are four perks linked to the 2019 SEGD Business and Leadership, on April 26, that you didn't know you wanted in your life until now. 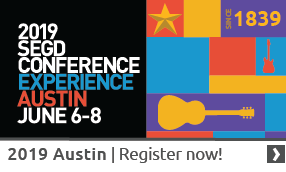 Does your boss need some persuading to sign off on your trip to Austin for the 2019 SEGD Conference, June 6–8? We've got you covered. Here’s a letter chock-full of ROI to get you there. You asked for it... SEGD is pleased to announce the inaugural SEGD Business & Leadership event, taking place April 26 in Chicago. Learn what top skills firm owners and studio leaders want their designers to possess and how this event will tackle them all—setting you up for success in leadership in your firm. As an employer, numerous opportunities cross your desk and in all the chaos, it can be challenging and time-consuming to sift through which programs and events are worth their value in money. However, we've made it easy for you. Here's why you want your employees to attend the 2019 SEGD Business and Leadership event on April 26. Between the flashing neon and the latest in entertainment, Vegas is dedicated to pushing the boundaries of what a branded environment is and should be; adding to what is already going to BE an amazing week. Read more about BE Prepared—Vegas is Calling! In less than three weeks, SEGD Branded Environments will kick off in Las Vegas. Still on the fence? Here are five reasons why SEGD Branded Environments is the place you need to be.